The grounds of the Bury Hill estate were landscaped at about the same time that the Fort, which was the location of my last excursion, was built. 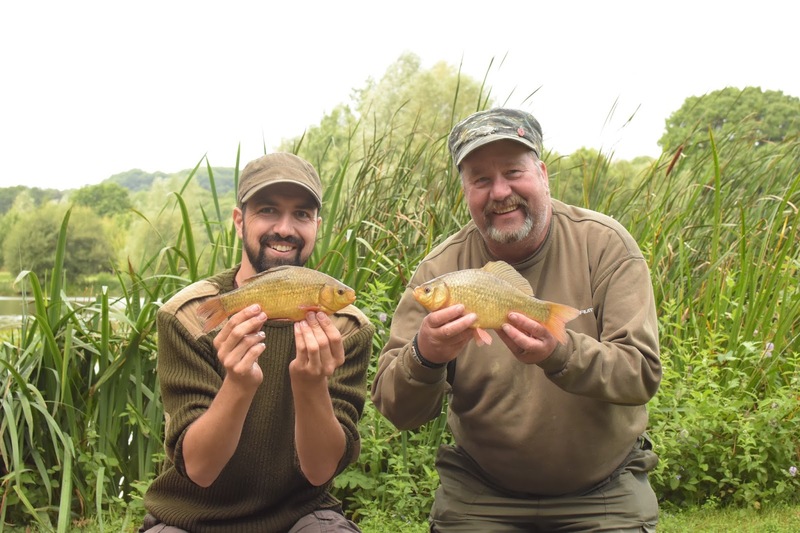 However, in spite of this and the fact that both venues host good shoals of my latest love, crucian carp, in many ways they could not be more contrasting. Compared to the Fort's moat which boasts a wild, unkempt beauty, Bury Hill is stately, serene and manicured to perfection! I travelled up here on this occasion with my good friend Kent who was also keen to catch a cru' and after a trip last year where we fished the main lake - 'Old Bury Hill', but caught little other than bream and perch, this year we opted for Milton Lake; a smaller pond lined with lilies and reed beds and reportedly well stocked with our quarry. The day started slowly but both of our floats plunged beneath the surface before long baring up only a small bream each. Humourous grumbles were exchanged before Kent suddenly exclaimed "I've got one!" and started walking over towards me with a crucian in the net, hoping for a photograph. As I glanced over my shoulder I saw movement in my peripheral vision. "So have I!" I answered as I lurched to prevent my feeder rod from being pulled off the rest - a rod I had not expected or for that matter hoped to receive a bite on as I favour the float for this species. 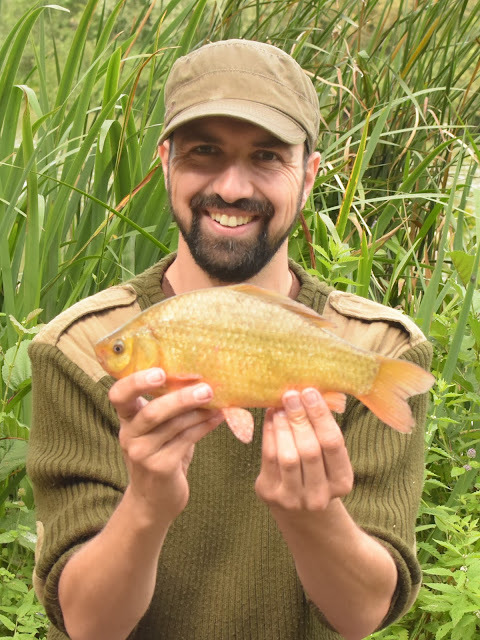 That said, whereas my experience of a crucian on the float at the moat was a relatively gentle affair, on the feeder here at Milton both the bite and the fight that followed were comparatively savage! Neither fish were massive but we were delighted nonetheless! Fishing for the rest of the day was fairly pedestrian but given that the gent in the shop where we purchased our tickets said it had been a little slow of late, we were grateful to be catching. 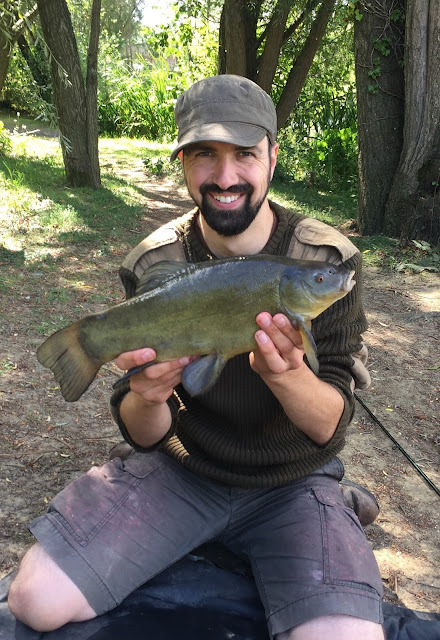 It seemed all I could manage on the float, no matter what bait I tried, were small perch and bream but the feeder rod, sporting a bright fruity banded pellet, produced a few nice tench and two crucians for me. 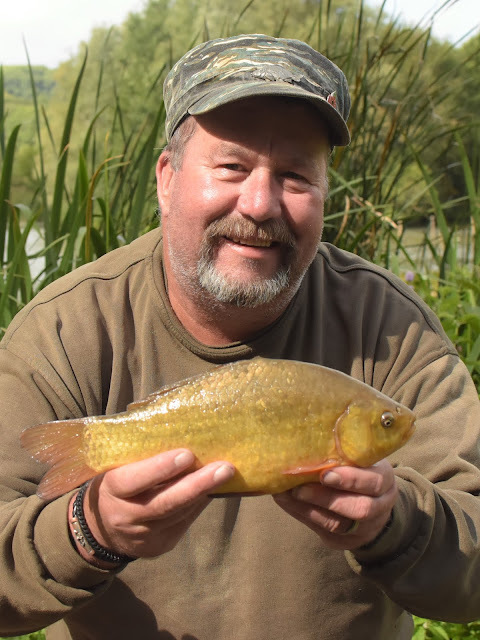 Kent however, had all his fish on the float including four crucians to 1lb 9oz which was a new PB for him! In spite of the very controlled conditions, this was a lovely day of pleasure-fishing. By no means was a catch guaranteed and we certainly had to work for each bite but they were definitely there to be had. 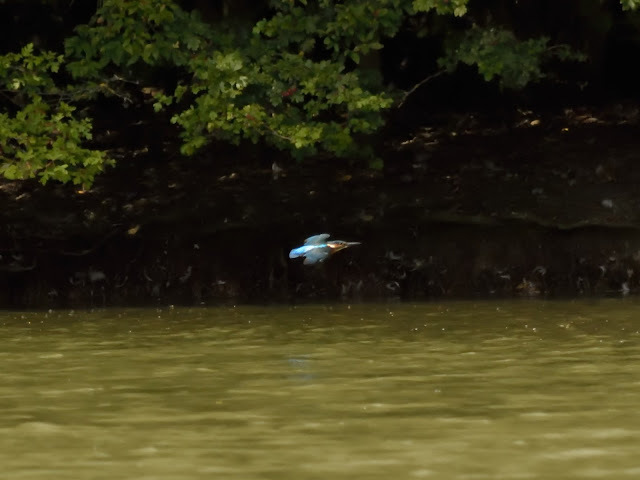 Whilst waiting for bites I could not help but notice an enormous wealth of birdlife - Kingfishers busy gliding back and forth, coots nesting, grey herons stalking the margins, tufted ducks diving, swallows swooping and buzzards high in the sky. On my previous visit with my father in February pike fishing on a punt on the old lake, we also spotted a red kite as well as all the aforementioned birds.